"The faster it is, the better I like it." Profile: Blurr is the fastest Autobot in motion and in conversation. He talks non-stop and continuously - if no one tells him to put a sock in it. And he is a superior messenger because he can whisk information from one place to another so fast that he is a blur in motion - hence his name - and almost a blur in giving his report until he's told to slow it down to a thousand words a minute or something somebody can understand. He is rather nervous and high-strung... not unusual for an Autobot who sometimes seems to be part-thoroughbred Cybertronic race horse (if there were such a thing). But he is courageous and loyal and determined to do what's required whether or not it's dangerous. 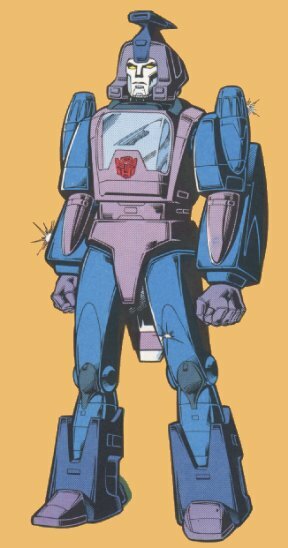 Abilities: In robot mode, he carries an electro-laser that reverses the polarity of an enemy robot's microcircuits and leaves him motionless. His humanoid mode is built for speed - and he looks longer and leaner than most Autobots. When he's in his vehicular mode, he is a racing car that routinely breaks the speed of sound and then some, leaving a trailing image as it hurtles across distances.